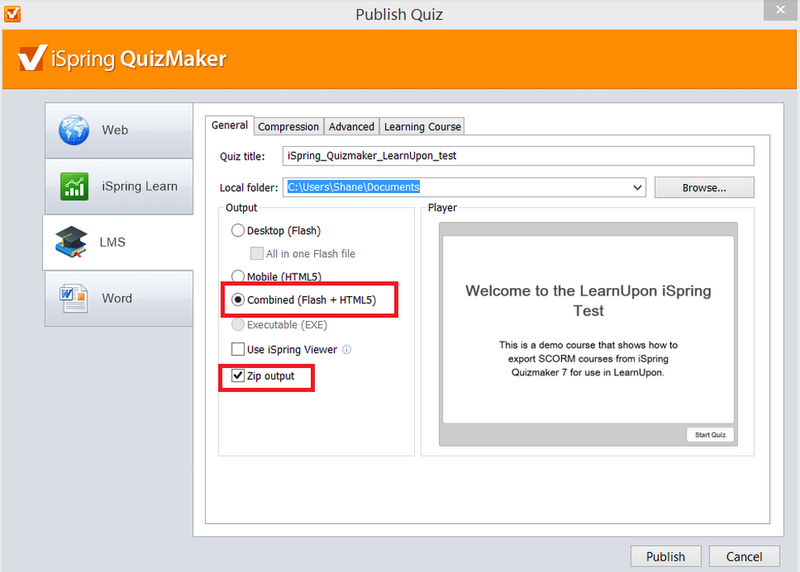 In this tutorial we will show you how to publish a SCORM quiz using iSpring Quizmaker 7 so you can prepare it for deployment on LearnUpon. Follow this step-by-step guide to ensure you choose the best settings for your SCORM content. For this tutorial we will publish the quiz as SCORM version 1.2 as this version is compatible with LearnUpon. We have our example course already created. This course is essentially a quiz that contains 7 different question types. 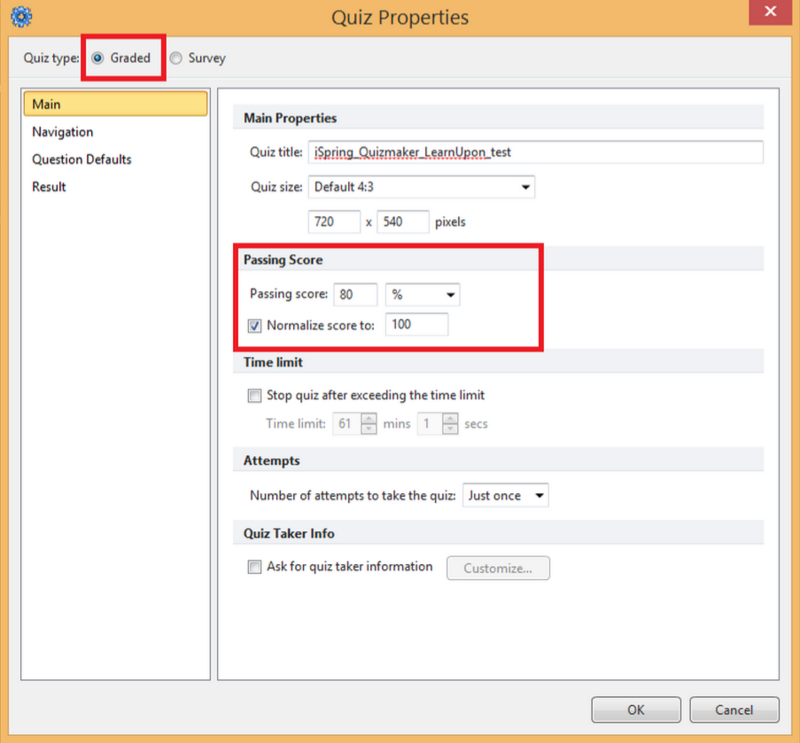 As this is a quiz based course, it is important to ensure that you have a passing score set. You can do this by clicking on the Properties icon in the toolbar. In this case, our quiz is graded and has a passing score of 80%. When you are happy with your passing score settings click ‘OK’ to save any changes you have made. 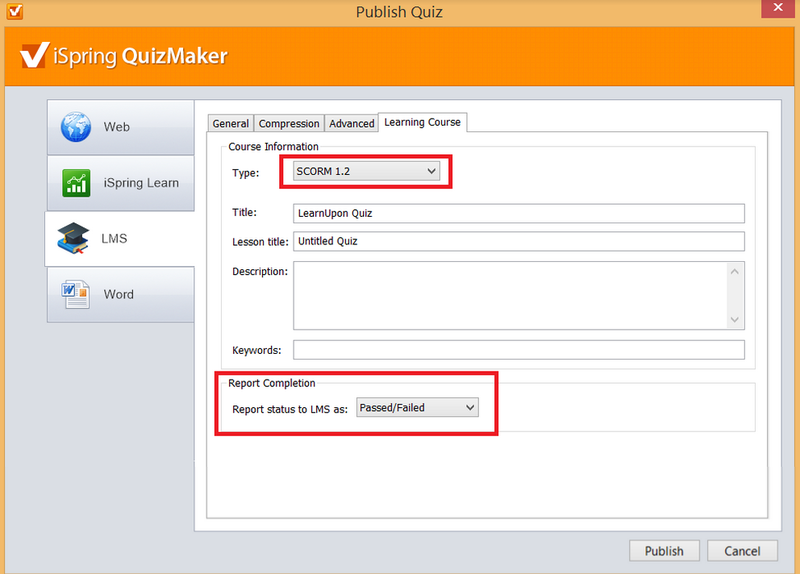 Our quiz is now ready to be published in a SCORM compatible format. To do this, click on the Publish button. 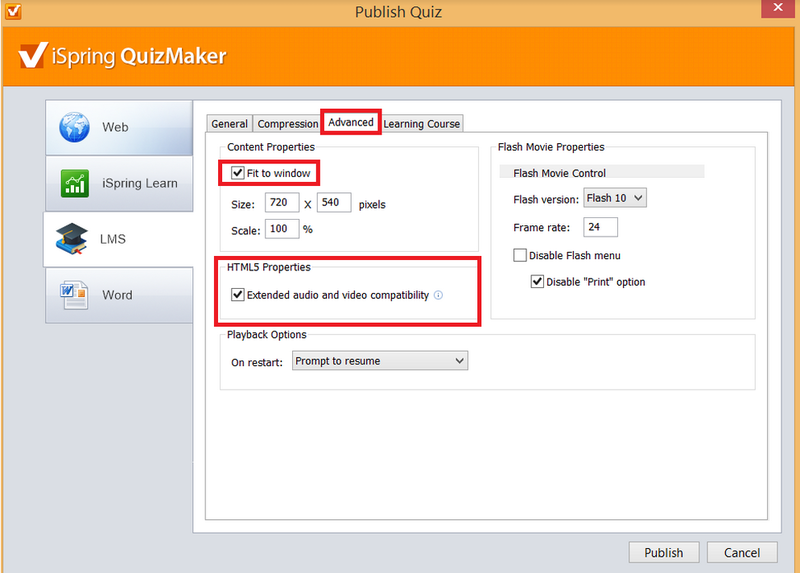 First of all you need to ensure that you have selected the LMS tab on the left hand side of the Publish Quiz window. In the Output section of the General tab choose the ‘Combined (Flash + HTML5)’ option. Choosing this setting ensures that the course will play on more browsers. Leave the ‘Use iSpring Viewer’ option unchecked and make sure that ‘Zip Output’ is selected. Next, click on the ‘Advanced’ tab. Under the ‘Content Properties’ section, select the option to ‘Fit to Window’. This will ensure that the course fills up all available space on the screen when your learners are viewing the content. Under ‘HTML5 Properties’, select the option for ‘Extended audio and video compatibility’. Choosing this setting will help to ensure that the course functions well across a variety of browsers by increasing the amount of supported audio and video codecs. Finally, click on the ‘Learning Course’ tab. The most important option here is to select SCORM 1.2 from the drop down menu. Take care to select ‘Passed/Failed’ as your reporting status. When you are done, simply click ‘Publish’. Your course will be exported as a zip-file and is now ready to be imported into LearnUpon. 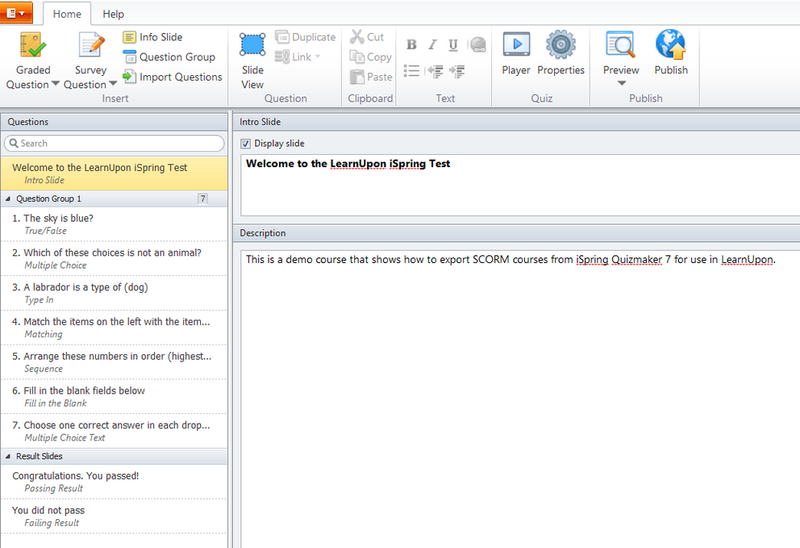 All you have to do is add a SCORM module to your course in LearnUpon by simply browsing for, and selecting your newly published SCORM zip file. LearnUpon takes care of everything else!